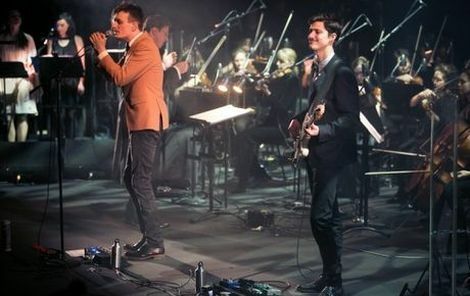 Efterklang bring orchestrated Arctic swells to the Bridgewater Hall, Getintothis’ Andy Kelly joins in the ovation. There may be only three permanent members in Efterklang but the stage at the Bridgewater Hall tonight must be home to 40 people or more. For this brief UK tour to celebrate the recent release of their 4th album, the Danish group are joined principally by the Northern Sinfonia orchestra and to rather wonderful effect. 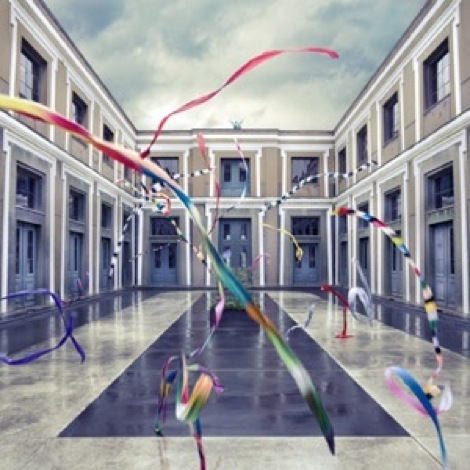 The album Piramida was inspired by a nine-day trip the band took to an abandoned Russian mining town of the same name within the Arctic circle. It might make you expect a somewhat sombre set, all glacial bleakness, a poor-man’s collection of Sigur Ros B-sides perhaps but the reality is thankfully rather different. Frontman Casper Clausen is quite the dandy in buttoned up jacket and bow-tie and he often sets the tone for each song before retreating literally to the shadows to allow the orchestra to bring the band’s vision to reality. His voice has tremendous range and at different times I’m reminded of the deepness of Stuart Staples of Tindersticks right through to Jonsi of the aforementioned Sigur Ros on the higher notes. Most of all though it’s the gorgeous sway of Matt Berninger of The National which comes to mind. The orchestra is initially almost restrained, meaning that the effect when they are unleashed is even more emphatic. But it’s in the quieter sections where the music gets you most, when just a single quiet note disappears into the distance – or has it? – the crowd often unsure of when a song has actually finished, so precise is this beautifully orchestrated indie folk. It will be a surprise if David Attenborough‘s dulcet tones aren’t heard over this music soon as the BBC’s Natural History department finds a new favourite to underpin evocative shots of the earth’s wonders. The main set ends with the distant recordings of the Arctic birds which must have been a constant soundtrack to their visit to the ghost town as shadowy figures are projected on to the stage backdrop. Cue standing ovation and a brief, two-song encore before they’re gone, perhaps a little too early at not much after 10pm but leaving us in no doubt that our journey – and theirs – had been well worthwhile.